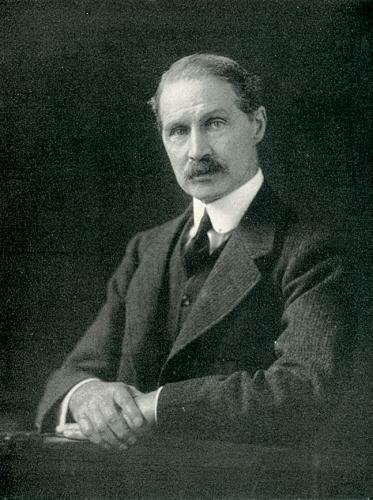 The biography of a British Prime Minister is an unlikely place to find the moves of a chess game, but one is given on page 541 of Robert Blake’s book on Andrew Bonar Law (1858-1923), The Unknown Prime Minister (London, 1955). 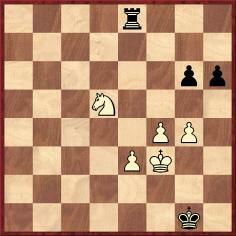 It was culled from page 122 of Chernev’s 1000 Best Short Games of Chess (New York, 1955). 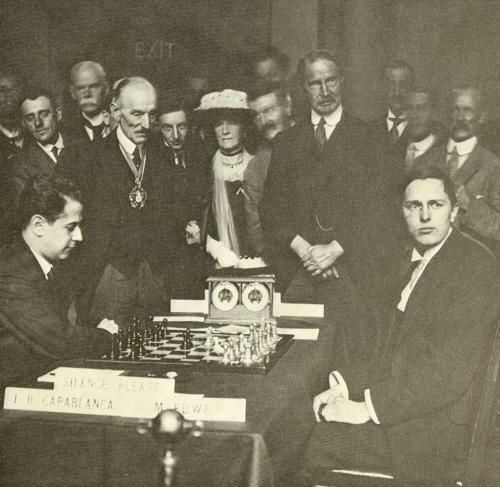 Black was Brian Harley, who had given the score on pages 62-63 of Chess and its Stars (Leeds, 1936), a book with a chapter on Bonar Law which included a game won by Capablanca against Bonar Law and two other Members of Parliament. 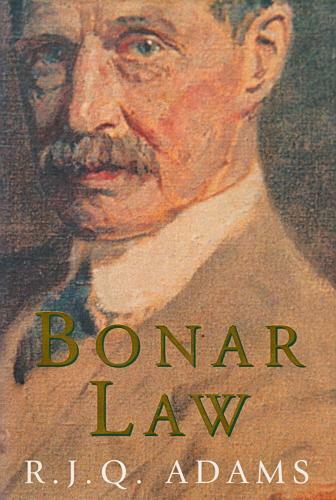 Harley described Bonar Law as ‘a strong player, touching first-class amateur level, which he had attained by practice at the Glasgow Club in earlier days’. 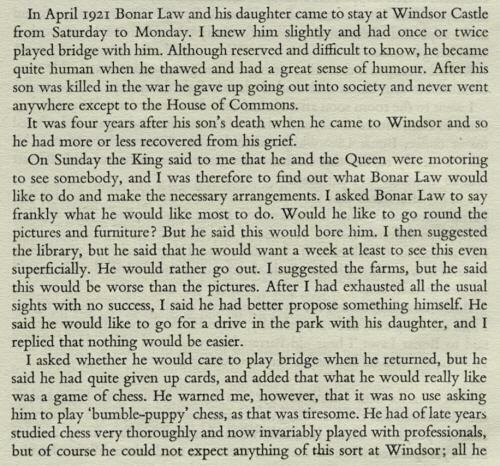 Harley wrote that he played over a thousand games against Bonar Law in the period after the Great War, and that the future Prime Minister had remarked to him that chess was ‘the only thing that keeps my mind on itself’. 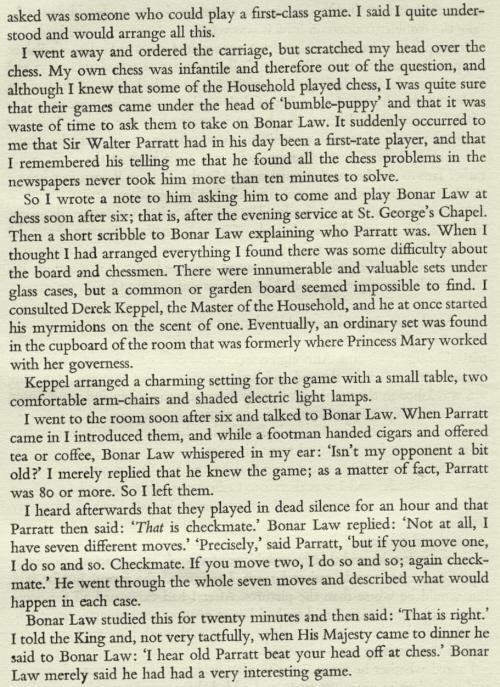 Page 474 of the December 1911 BCM stated that Bonar Law was believed to have been a member of Glasgow Chess Club since 1886 and that, ‘with the possible exception of Mr W.W. Rutherford, of Liverpool, Mr A. Bonar Law is probably the strongest chess-playing member of the present House of Commons’. Eight years later the magazine had not changed its mind. Page 10 of the January 1920 issue again named the two as the strongest Members of Parliament. 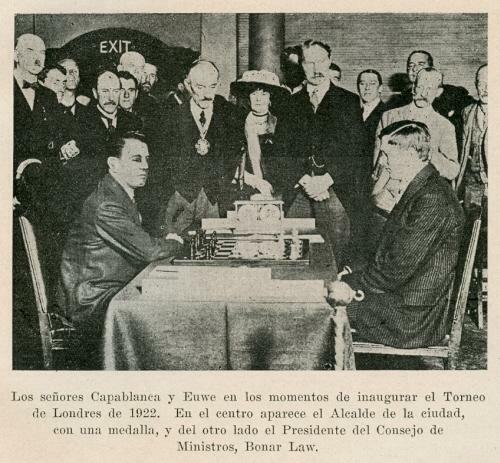 This was on the occasion of Capablanca’s 40-board simultaneous display at the House of Commons, during which Rutherford was one of only two players to draw. 1 e4 e5 2 Nf3 Nc6 3 Bb5 a6 4 Ba4 Nf6 5 O-O Nxe4 6 d4 b5 7 Bb3 d5 8 dxe5 Be6 9 a4 Rb8 10 Be3 Be7 11 Nbd2 f5 12 axb5 axb5 13 Nxe4 fxe4 14 Nd4 Nxd4 15 Bxd4 O-O 16 Ra6 Qd7 17 Ba7 Rbd8 18 Qd4 c6 19 Rd1 Kh8 20 Bb6 Rc8 21 Bc5 Bxc5 22 Qxc5 Qc7 23 Ra7 Qxe5 24 Re7 Qf6 25 c3 Bg4 26 Ra1 d4 27 h3 Qxf2+ 28 White resigns. Source: American Chess Bulletin, January 1914, page 10. The Bulletin took the game from the Weekly Irish Times. 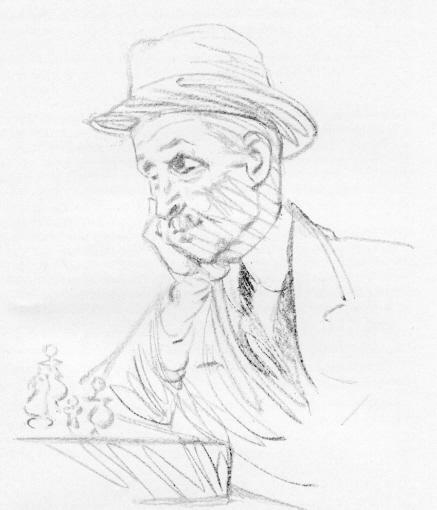 The above sketch (‘Bonar Law playing chess at the Café de la Régence in Paris, from a drawing by L. Berings, summer 1921’) was published opposite page 432 of The Unknown Prime Minister by Robert Blake (London, 1955). 14 Nxg6 hxg6 15 Nxe4 Nxe4 16 Bxe7 Qxe7 17 Rae1 Nd6 18 Qxa8 Qf6 19 Qxa7 Nb5 20 Qc5 Nxd4 21 Qxc7 Kh7 22 Re3 Nf5 23 Rh3+ Kg8 24 Qc4+ Rf7 25 Rc3 Kh7 26 Rf3 Re7 27 g4 Qg5 28 Kh1 Nh4 29 Rf8 Qe5 30 Qg8+ Kh6 31 Qh8+ Kg5 32 f4+ Resigns. Source: Times Literary Supplement, 20 May 1909, page 192. R. Lob was Oxford University’s top player at that time. 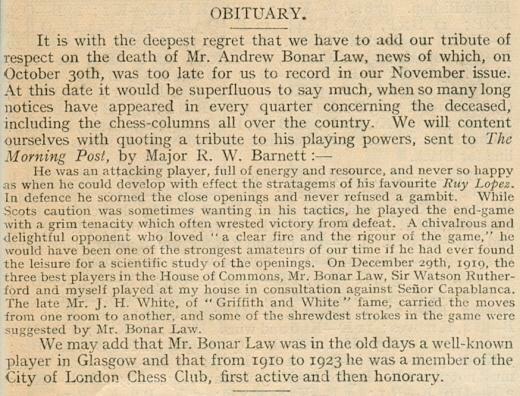 Bonar Law’s connection with Glasgow chess was mentioned in a brief report in the Morning Post which was reproduced on page 102 of the January 1923 Chess Amateur. 1 e4 e5 2 Nf3 Nc6 3 Bb5 a6 4 Ba4 Nf6 5 O-O Nxe4 6 d4 b5 7 Bb3 d5 8 Re1 Na5 9 c3 Be6 10 dxe5 Bc5 11 Be3 Bxe3 12 Rxe3 O-O 13 Bc2 Nc4 14 Re2 Nxb2 15 Qc1 Nc4 16 Bxe4 dxe4 17 Rxe4 Qe7 18 Nd4 c5 19 Nb3 Rfd8 20 N1d2 Rd3 21 Nxc4 bxc4 22 Nd2 Rad8 23 Nxc4 Bxc4 24 Rxc4 Qxe5 25 f3 Qe2 26 White resigns. 1 d4 d5 2 Nf3 c5 3 c4 Nf6 4 Nc3 e6 5 Bg5 cxd4 6 Qxd4 Be7 7 cxd5 exd5 8 e3 Nc6 9 Bb5 O-O 10 Bxc6 bxc6 11 O-O c5 12 Qd3 h6 13 Bxf6 Bxf6 14 Qxd5 Qxd5 15 Nxd5 Bxb2 16 Rab1 Rb8 17 Nd2 Ba6 18 Ne7+ Kh8 19 Nc6 Rb6 20 Nxa7 Bxf1 21 Kxf1 Ra6 22 Rxb2 Rxa7 23 Rc2 Rc8 24 Ne4 Ra4 25 Rxc5 Rxc5 26 Nxc5 Rxa2 27 h4 Kg8 28 g3 Kf8 29 Kg2 Ke7 30 Kf3 Kd6 31 Nd3 Ra3 32 Nf4 Ke5 33 Ne2 Kd5 34 Nd4 Ra6 35 g4 Rf6+ 36 Kg3 g6 37 Ne2 Ke4 38 Nf4 Ra6 39 Kg2 Ra5 40 Ne2 Kd3 41 Ng3 Kd2 42 h5 Ke1 43 hxg6 fxg6 44 Kf3 Ra2 45 Ne4 Rb2 46 Kg3 Kf1 47 Kf3 Kg1 48 Kg3 Rb8 49 Nc3 Rf8 50 f4 Rc8 51 Nd5 Re8 52 Kf3 Drawn. Source: issue 32 of Les Cahiers de l’Echiquier Français, pages 483-484. The French magazine indicated its source as The Times (no date provided). 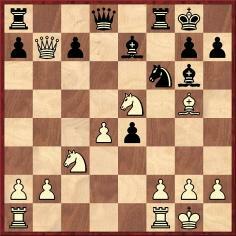 1 e4 e5 2 Nf3 Nc6 3 Bc4 Bc5 4 d3 d6 5 c3 h6 6 h3 Nf6 7 Bb3 O-O 8 O-O Kh8 9 Qe2 Nh7 10 Be3 Bb6 11 Nfd2 f5 12 Bxb6 axb6 13 f4 exf4 14 Rxf4 fxe4 15 Rxf8+ Qxf8 16 Nxe4 Bd7 17 Nbd2 Ra5 18 Nf3 Qe8 19 d4 Bf5 20 Re1 Ra8 21 Nh4 Qd7 22 Ng3 g6 23 Ngxf5 gxf5 24 Qh5 Ne7 25 Rxe7 Resigns. Source: Falkirk Herald, 31 January 1923. 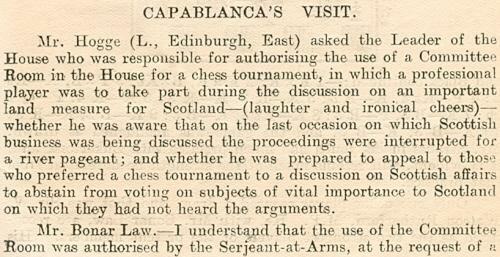 At the time of the game, Bonar Law was President of the Scottish Chess Association (BCM, May 1897, page 174). 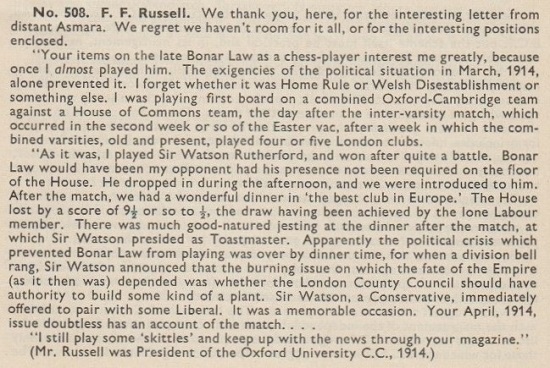 For a further brief feature on Bonar Law (from the New York Herald Tribune) see page 43 of the March-April 1947 American Chess Bulletin. Note: Items in the present article which we originally presented in Kingpin are indicated by the letter K and the year of publication. 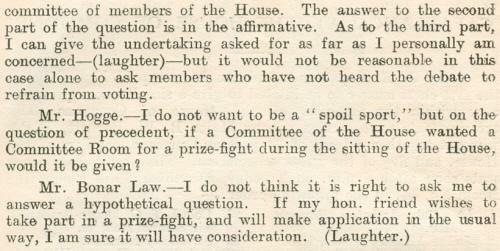 On page 229 of the September 1957 issue the result of the Oxford/Cambridge v House of Commons match was given, courtesy of Kenneth O. Morgan, from page 13 of the Times, 25 March 1914. The contest had taken place the previous day. Latest update: 8 January 2019.